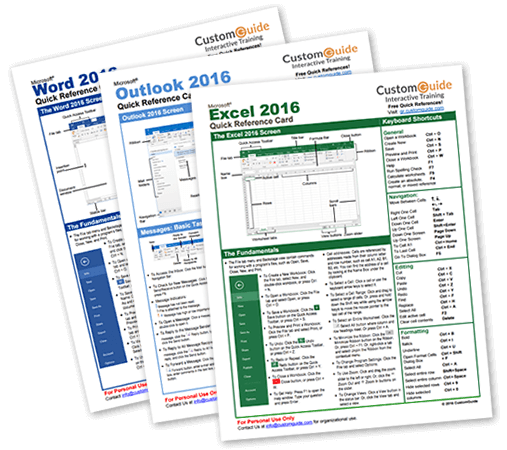 Scroll down for free reference guides for Office 2016/2013/365 programs. Free training for Office 365 and all of the programs (Word, Excel, PowerPoint) as well as templates and resources for small businesses. Microsoft Office Tutorials from GCF. Free tutorials on Office 2016 (Word, Excel, PowerPoint, and Access) as well as previous versions of Office. Lynda has a wide variety of tutorials about computer programs, business tools, and many other skills (including so-called soft skills). If you have a NYPL card, you can use Lynda for free.